Koding lets your organization create and share fully automated dev environments on any infrastructure for modern distributed applications, micro-services and containers. Koding provides an interface for developers and team managers to streamline dev workflows in the cloud without slowing down freedom and creativity. Spend less time configuring and more time building! Koding saves 1000 people organization $30M and gives back quarter of their year. Your entire team can share and collaborate on not only on your code, but also your dev environment. No more screen sharing. You can share dev environments in real-time, or leave it open for the whole team. For the first time, your team can locate the inefficiencies in their workflow, so that they can prioritize and fix them. A company with 1000s of developers waste at least a quarter of their year on configuring dev environments. Koding gives the time back to you. No more online IDE! Use your own IDE, code editor and terminal. Koding’s CLI tool allows volume mounting and ssh’ing into their VMs. You can try either cloud hosted or on-prem version of Koding; use your private cloud to provision dev environments. Easily understand where your process has bottlenecks and locate holes in productivity. Koding analytics will give you most critical information about the performance and efficiency in your organization. Engineers are no longer limited by the gatekeepers who create their dev environments, they are working together to create the best environments using Terraform, supporting more than 70 providers. We believe Cloud is the next frontier in our next advance as humans. Jonas Jacobi, Vice President, Cloud and Mobile Technology Strategy at IBM and Devrim, CEO of Koding talk about the future. 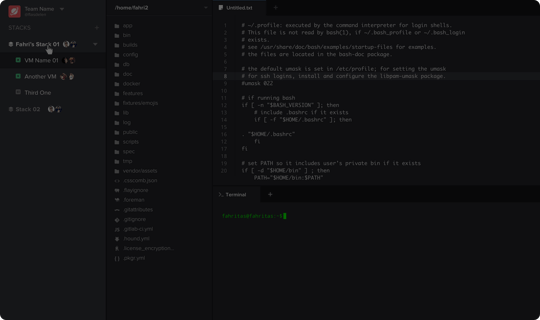 Koding can provision dev environments on your favorite cloud providers. You have a "Download" link that everyone clicks, yet vital customers are lost through your setup instructions. Let's help you engage with them! If you'd like to extend your ecosystem and build more apps for your organization! One solution might work well for an app and fail in yours. It’s not a one-size-fits-all thing.